This page is for the game released in 2017. 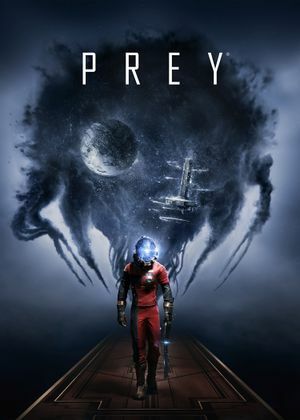 For the game released in 2006, see Prey. Offers very limited support for turning off unwanted UI elements. 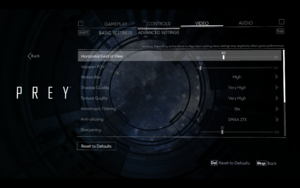 See Prey Interface Customizer. Deluxe Edition or Mooncrash DLC owners automatically receive Prey: Typhon Hunter, which contains the MultiPlayer mode and TranStar VR. Some copies may only include the Steam installer. Includes Prey: Typhon Hunter for free. 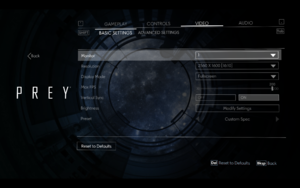 Right click Prey in the Steam library, click Properties, click SET LAUNCH OPTIONS, and add "-skipArkIntro" in the text box, including the quotes. This method only skips the Arkane and Bethesda logo sequences. Delete or rename ArkaneLogoAnim_Redux_1080p2997_ST-16LUFS.bk2, Bethesda_logo_anim_white.bk2, LegalScreens.bk2, and Ryzen_Bumper.bk2. Be careful; the names of other video files may contain spoilers. Allows you to change the UI, HUD, notification sounds, disable motion blur, adjust image sharpening and add bindings for more actions. Adds missing shadows, volumetric lights and fog, reflections, particle effects, sun flares, improved view distance(editable in-game via an advanced settings menu), parallax occlusion mapping, and persistent decals, among others. This mod is only for the main game, not the Mooncrash DLC. Save files and key bindings. HUD scales to sides of screen and menus appear to have no visible issues. Game is Vert-, increase FOV to compensate. Slider from 60° to 120° horizontal. Use Flawless Widescreen for values up to 150°. Use PRIC to adjust the weapon FOV or have a fixed FOV when sprinting. SMAA, FXAA and Temporal SMAA 1TX & 2TX. Turning off AA disables object highlighting. Capped at 144 FPS. See High frame rate. Open the game and make a change to any video setting. Change sys_MaxFPS = 144 to the desired FPS cap. Alternatively, higher frame rates can also be achieved by turning on V-sync. This introduces some input lag, but the amount is very small at frame rates over 144. Can disable motion blur and change the image sharpening amount. Create a file called autoexec.cfg and open it with a text editor like Notepad. Add the line r_MotionBlur = 0 and save the file. Weapon wheel (middle mouse button) can't be remapped in-game. See Remapping for a workaround. Some minor commands (i.e. closing certain tutorials) are permanently bound to the default keys. XInput has been reintroduced in the Blood Moon update. 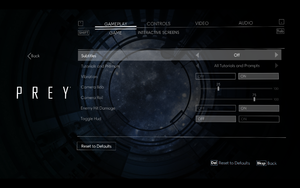 Remapping is available by enabling the game's official SIAPI implementation through the game's options menu. Steam and Nintendo Switch prompts are only available through enabling SIAPI. The Blood Moon update has added the option to disable SIAPI through the game's options menu to enable the game's Xinput. Look for the line <actionmap name="player"> and paste the following code below it. In this example the weapon wheel is now remapped to B on your keyboard. This can be changed to your liking. 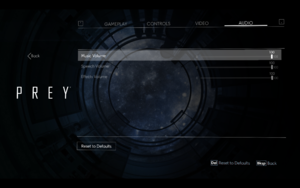 See Helix Mod: Prey 2017 (DX11). 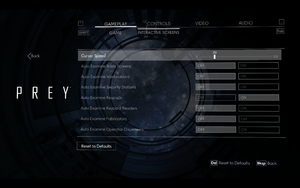 Use Prey Interface Customizer to force the game to use XInput. Alternatively, if you don't want to use Interface Customizer and just want a lightweight fix for XB/PS controllers, use PreyXInputFix. ↑ 1.0 1.1 File/folder structure within this directory reflects the path(s) listed for Windows and/or Steam game data (use Wine regedit to access Windows registry paths). Games with Steam Cloud support may store data in ~/.steam/steam/userdata/<user-id>/480490/ in addition to or instead of this directory. The app ID (480490) may differ in some cases. Treat backslashes as forward slashes. See the glossary page for details. This page was last edited on 16 April 2019, at 03:29.